Many people now believe that fake news contributed to Donald Trump’s victory in the 2016 presidential election. I’ve seen this issue debated a number of times around the web, and whenever it’s discussed there tends to be a great deal of conceptual imprecision. Different people have widely divergent understandings of what constitutes “fake” news. This has led many people to misunderstand what fake news is, why it exists, and what its significance is. Ideological news–news which interprets descriptively true facts in an overtly normative way, informed by substantive moral beliefs about what should be done. Descriptively false news–news which makes untrue descriptive claims. But this isn’t really true–in practice, people are much more likely to click on stuff which offers an interpretation, because normative interpretations are interesting and entertaining. Our media is mostly privatized and makes money by selling advertising, and advertisers won’t buy ads for content which does not generate views and clicks. So the media has a strong economic incentive to give consumers what they will look at, which means there is a strong incentive to present facts with normative interpretation. “Infotainment” draws more eyeballs than raw information alone. The result is that all news is increasingly accompanied by interpretation and that necessarily means it’s ideological. The mainstream media is often accused of being uniquely ideological, but this is false–the neoliberal ideology that dominates mainstream media is just different from the anti-establishment left egalitarian and right nationalist ideologies that dominate alternative media. Readers sometimes praise my work for being unbiased, but I do not write posts which offer facts alone–I use my academic training to interpret the news through the lens of my own normative political theory, and in that sense my work is still ideological, just like anybody’s. If there is a difference, it’s that I openly make normative appeals and do not attempt to conceal the fact that my work is normative. Many interpreters don’t make their normative moral arguments explicitly, instead implicitly embedding them in their material. They present their own ideological beliefs as if they were neutral journalism, and that feels more deceptive than my overtly normative writing, which is always openly about what I believe should be done. There’s nothing wrong with ideological writing, provided that the author presents their arguments honestly, without pretending that their normative moral claims are descriptive claims. Unfortunately, during the 2016 election, a lot of journalism became inflected with unacknowledged ideological content. Many journalists viscerally dislike Donald Trump because his campaign made the press into a punching bag. At times this went so far as to make journalists feel that they (and the freedom of the press) are unsafe in his hands. This led to a lot of unacknowledged anti-Trump ideology. Many Clinton supporters did not have a problem with this–indeed, some commentators believe that journalists have a duty to protect the public from people like Trump. But because much of this content was obviously ideological but did not acknowledge itself as such, it damaged the credibility of the mainstream media. A similar phenomenon happened on the left during the primaries–many Bernie Sanders supporters felt that the mainstream media was clearly ideologically on Clinton’s side even as it denied this and refused to acknowledge it. It was not the fact that the media was ideological that bothered Trump and Sanders supporters–it was the fact that the media purported to be neutral even as it was blatantly ideological. Unacknowledged ideology feels deceptive. Acknowledged ideology feels authentic. So many people on both the left and the right lost confidence in the mainstream media and began turning to alternative media sources which were still ideological, but in a more overt way (and in a way which synced up with their own normative beliefs). Now, here’s where it gets complicated. Many of these people not only lost confidence in the normative interpretations offered by mainstream media, but in the descriptive fact claims that these interpretations are built upon. Consequently, they came to believe that there was no point in consuming content from other ideological perspectives on the grounds that even the descriptive fact claims were “mainstream media lies”. 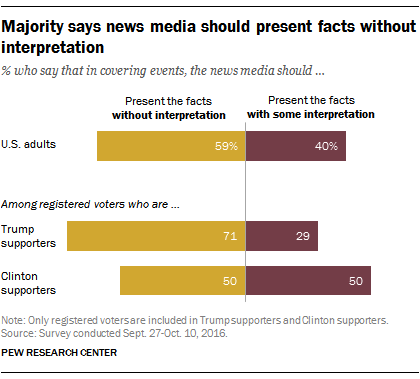 This is a result of the conflation of ideological news with false news–people began assuming that if the media was deceiving them by smuggling in ideological interpretations, it was also deceiving them about the basic facts. This is a mistake–most media outlets still print descriptive facts. It’s the ideological interpretation which usually needs to be questioned, not the fact claims themselves. But because people assume that these things go together, they tend to trust media sources which agree with them ideologically even when these sources were making descriptively false claims. Attempts by mainstream media and fact-checking websites to debunk these claims are then dismissed and accused of being deceptive, but again this accusation conflates ideology and descriptive fact together. The fact checkers almost always get the facts right, but they tend to offer interpretations of those facts which are ideological and have to be questioned. But the genie is out of the bottle. Because mainstream media was often deceptively ideological, it has also lost many people’s confidence that its descriptive claims are true, because too many people conflate normative and descriptive claims together. This has damaged the ability of any given source or set of sources to act as authorities of descriptive truth. The result is that different ideologies are not merely interpreting the facts differently, they are working from different sets of facts, making it impossible for these ideologies to engage with one another effectively. False news can proliferate unchecked because there is no consensus anymore on which media outlets are reliable. Gullible people–those who consume mainstream media uncritically and consequently assimilate its ideology. Hyperskeptics–those who reject mainstream media’s ideology but also reject its descriptive authority, consequently coming to believe lots of things that are straightforwardly false and sometimes constitute outright conspiracy theory simply because these false claims come from ideologically friendly sources. It is the tendency for people to fall into one of these two groups that makes the current media landscape so pernicious. The number of people who are capable of challenging the ideological content of the stuff they read without adopting an irrational skepticism about the descriptive fact claims is too small. People are either too gullible or too skeptical. Voters can’t help but click on interpretive content which is deceptively ideological, even though consuming this content lowers their trust in the organizations that produce it. This economically forces mainstream media to produce content which destroys its own credibility and weakens it as a political arbitrating force. Voters can’t help but conflate ideological news with fake news, so the more they mistrust mainstream media’s ideology, the more they mistrust its fact claims, and the less able it is to effectively act as arbiter. It’s those two facts about the voters which cause fake news to arise and make it effective. As long as they hold, no one will have the authority or public trust to challenge fake news, because no one will agree on which news is fake and which is not, and accusations of falsehood will be interpreted as ideologically motivated. The lines between different ideologies will harden and it will become increasingly difficult to have debates about political issues that have any potential of persuading anybody. That’s what “post-truth” ultimately means–a democracy in which the voters create an incentive context for the media which ultimately destroys the ability of the media to perform its function as arbiter of descriptive truth. It is a form of democratic decay, and it destroys the very tool we would ordinarily use to combat it–the descriptive authority of the press. There is nothing the press can do–outlets which attempt to present information without interpretation won’t get eyeballs and won’t sell ads. The press is now expected to entertain, and entertainers are not trusted as arbiters of truth. It’s a death spiral and its roots in our democracy go much deeper than the fake news stories themselves and the simplistic narratives surrounding them.